No one knew the worth of ancient systems of water harvesting more than Anupam Mishra, the man who travelled length and breadth of India for three decades in his quest to understand traditional water harvesting systems. With the passing away of the 68-year-old environmentalist and water conservationist, curtain came down on an era of relentless struggle to revive indigenous wisdom on water harvesting and management systems and pass it on to those who have long forgotten it. More than 20 years ago, Mishra wrote a 120-page-book ‘Aaj Bhi Khare Hain Talaab’ (Ponds are still standing). It is still considered a gospel for development agencies, environmental groups and policy makers looking for indigenous wisdom on water harvesting and management systems through talaabs (ponds). It is one of the only books after Mahatma Gandhi's "My Experiments with Truth", to be available in Braille. A career that was later devoted selflessly for inspiring people to take up work on setting up and reviving traditonal water harvesting systems had begun with an attempt at studying and chronicling the Chipko movement in the 1970s. His curiosity to know what different communities were doing with water took him far and deep into the water-starved areas in rural India. Impressed with traditional rainwater harvesting techniques followed by the people of Rajasthan—the driest states of India with only one per cent of the total surface water resources of the country—the recipient of the Jamnalal Bajaj Award had once said, “The society has defied all the adverse conditions in matter of water, to live and find the traditions of life and have done diverse efforts at different places to let the mirage fail. 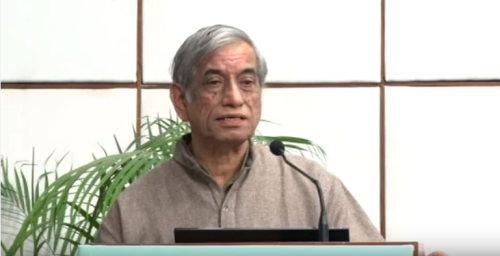 A founding member of the Gandhi Peace Foundation, Mishra remained staunch advocate of decentralised water storage systems like baolis (step wells), kuis (wells with small diameters), chaals (small water body along a slope) and johads (tanks that are fed by earthen check dams) that can help communities withstand drought. In a sharply worded criticism of the government’s Ken-Betwa River linking project, Mishra had called for speeding up the formation of National Rainfed Area Authority and argued that the drought-hit Bundelkhand region can meet its water requirements with a fraction of the commitment and investment the Indian government was showing to river-linking. Awarded the Indira Gandhi Paryavaran Puraskar, instituted by the Ministry of Environment and Forests, in 1996, Mishra dreamt of India as a self-sustainable country that knows how to conserve a precious resource. At a time when large swathes of India come under the grip of frequent drought, water scarcity is turning into a chronic problem and rainwater harvesting structures in many places are in state of disrepair and neglect, Mishra’s acumen and altruism will be sorely missed.